Don’t want to look too geeky wearing a smartwatch around? I believe a reason as to why some women wouldn’t be comfortable wearing a regular smartwatch is because its look will not blend in with their other wrist ornaments. The H.Tang (or HeTang) smart watch is designed for ladies. It has a stainless steel water-proof body, a leather strap, a hand polished sapphire display, and Swarovski crystals encrusted around its rim. 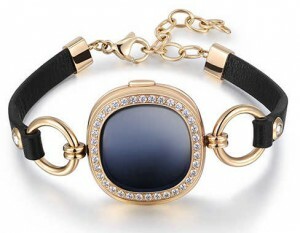 So it serves as a smartwatch and a classy bracelet at the same time. 1. Syncs with your Android or iOS device to receive text messages and call alerts. 2. Track your calorie intake. 3. Display time, date, and weather information. 4. Has a UV sensor to display sun intensity. The HeTang ladies smartwatch is currently in crowdfunding stage at Pozible and is expected to release its first batch of products a few days after the funding ends. With 46 days left on the crowdfunding project, they have already achieved an amazing sum of $35,176 USD which surpasses their goal of $8,156 by more than 400%. To get a H.Tang ladies smartwatch, you will have to make a pledge of $82 via their project page (linked to above).